I received NameCheap newsletter today full of annoying holes (at least for me), needless to say I hit the unsubscribe button shortly after. First mistake – mark your calendars. Did they not check their calendar before sending it? The June 10 was 2 weeks ago! $1, one dollar!! You’re trying to promote .UK, use the local currency, using £ (GBP)! Final mistake I notice (I didn’t look very hard to be honest) was the “SCHOOLSOUT” code. Sorry, that’s not till next month. 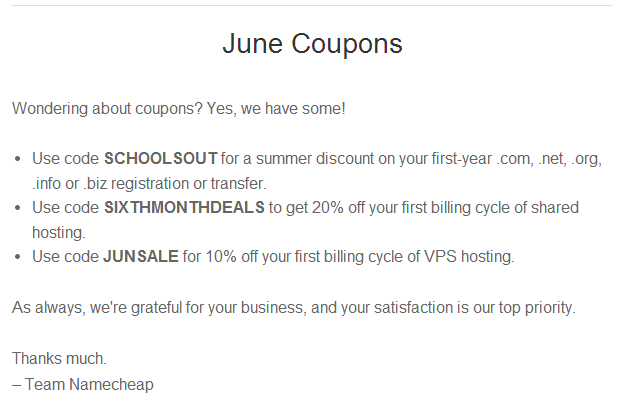 Perhaps someone should buy NameCheap a calendar.